Get an exclusive look behind the scenes of Bloomington and the Mall of America at the Top Secret After-Party. In a secret location with a secret entrance code at the Mall of America, Radisson Blu Mall of America will host a dessert bar and specially crafted after dinner drinks. Network with others including Special Guest Congressman Dean Phillips while you celebrate Bloomington and its bright Future Leaders! This is an additional fundraiser for our student scholarships. Limited number of tickets available for purchase along with your Gala registration - either prior to or at the Gala, first come first serve - $60.00 per ticket. 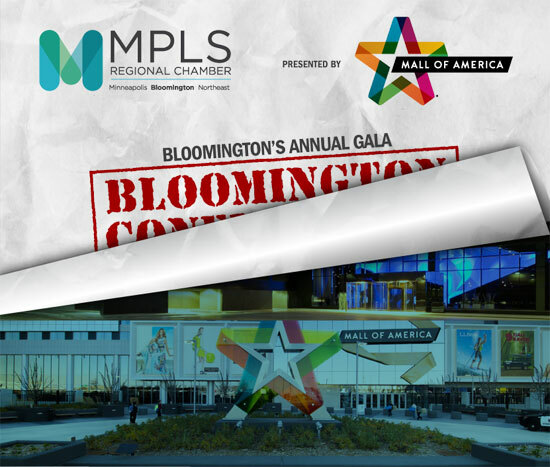 The Bloomington Annual Gala celebrates our great city and generosity of spirit to directly benefit high school students at Bloomington Jefferson and Kennedy High Schools that are part of the chamber's Bloomington Future Leaders Program (BFL). Each year, the Bloomington Chamber gives away scholarships to bright, eager students pursuing their dreams to post-secondary education and career paths that can benefit our local workforce and economy. Warm up the lives of Bloomington students on a cold night in February! We'll have plenty of local stations to satisfy your cravings while you explore, get into bidding wars and network. A portion of the proceeds will benefit high school students at Jefferson and Kennedy High Schools. Warm up the lives of Bloomington students on a cold night in February! Proceeds benefiting Bloomington Future Leaders, a program of the Minneapolis Regional Chamber Development Foundation.